In 1889, twenty-five-year-old newspaper reporter Nellie Bly set sail on an ambitious journey, to travel around the world alone…and break the record set by the protagonist of Jules Verne's novel Around the World in Eighty Days. She succeeded, with eight days to spare, and became a hero to women the world over. 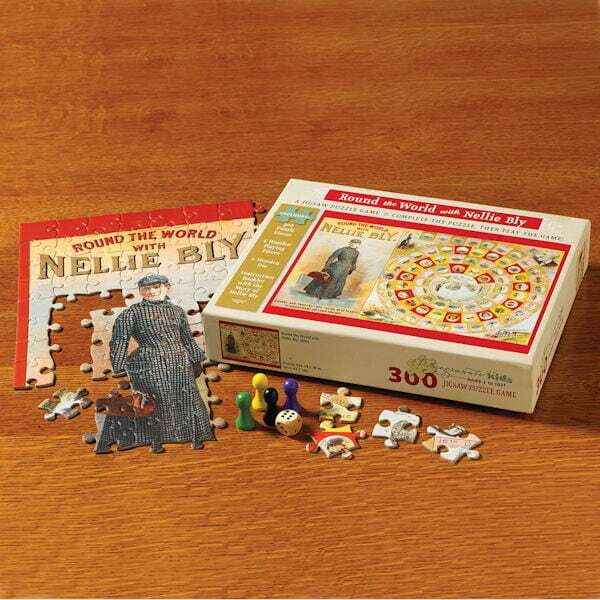 We've long admired the intrepid reporter, so we were thrilled to find this reproduction of the 1890 board game Round the World with Nellie Bly. Players ages 3 to 103 will get a kick out of this vintage game, which traces Bly's extraordinary 72-day journey around the globe. But there is one catch: Before you can play the game, you must solve a 300-piece puzzle to build the game board! The puzzle measures 18"x24" when complete and includes four game pieces, one die, and an instruction booklet enriched with a brief biography of Nellie Bly. Bon voyage!